Oriana Fiumicino is a storyteller, playwright, stage actress and director from Italy. 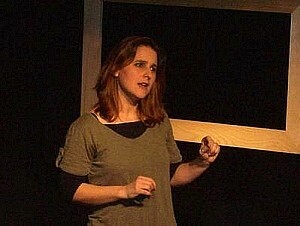 She has a degree in History of Theater, and she attended courses in oral narration with Laura Curino and Sista Bramini. She also attended the writing course by Raul Montanari and autobiographical writing by Giorgio Vasta at the Holden school in Turin. Since many years she teaches Educational Theater at the Auxilium University. She supervised the preparation of several shows for young people in some Roman and Milanese schools and was worked with I Lunamboli, a Playback Theater company for over seven years. Until 2009 she worked as a speaker and journalist at Radio Capital and Radio Deejay.